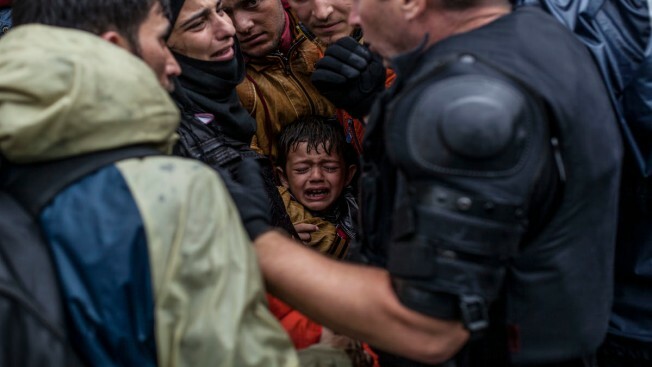 A Syrian refugee boy cries while he and his family try to board a train at the station in Tovarnik, Croatia, Sunday, Sept. 20, 2015. Police said Saturday more people are coming in from Serbia, mostly near the eastern border town of Tovarnik, where there are already around 2,500 people waiting for transport. Central Falls, Rhode Island, Mayor James Diossa has joined 17 other city leaders across the country in personally asking President Barack Obama to send Syrian refugees their way. Diossa is asking Obama to increase the number of refugees allowed into the United States so he can extend help to those in need. Secretary of State John Kerry has said the U.S. will accept 85,000 refugees from around the world next year, and up to 100,000 in 2017. Diossa said Tuesday he was inspired by Pope Francis' recent visit "to reach out and help." He says he hasn't discussed finances with the White House but knows families willing to take in the refugees. Central Falls has a population of approximately 19,000 people.